"In Search of a Round Table"
One image keeps surfacing: A table that is round. That the table has been turned round? to wholeness and to food. For the "least of these". And disturbing profound peace for all. We can no longer prepare for the past. We are bound to follow. That is His and not ours. 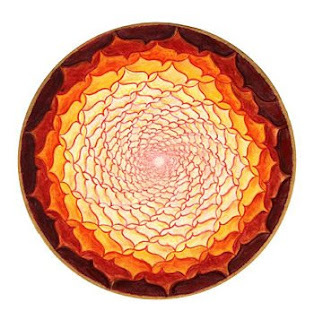 The mandala, known as the Transformation mandala, was created by grace.golddogdesign.com. We have had a strange and unusual Spring here in southern Oregon. Here it is nearing the end of April and we are still getting snow in the mountains and the valleys, including my own. It could be another one of those years where we are in the 40's and 50's until the first of May when it will--as before--rocket to 80 degrees within 24 hours and leave us all stunned and coming down with colds...joy. I want the warmth to come, the light, bright and good, the greening of my world. I need the light to shine in the darkness of my weary spirit; weary from grief, loss, hurriedness, workday stress, the loneliness in the crowd kind of feeling, the stillness of my home. I want to put my hands in the earth and inhale her in all of her fertility and life-giving presence. I want...no, I need flowers and growing things to involve my hands and heart in moving meditation and in those moments, continue a silent dialogue with God about everyday stuff, and about what I'm to do with my life, aside from the usual perambulations of the every day. I spoke with my spiritual director this last Sunday, and we talked about finding our identity as women of our respective generations. From where we have been to where we are now and what the future may make of us in time. There are times when I find myself in a mental desert searching for myself, if only I knew what I was looking for, I may find it. Or maybe its a mountain I must climb to test my endurance of the seemingly ordinary. On other days I think I have figured it out but you know, we never really do...figure "it" out that is. We lead ourselves to think we are coming within reach only to discover that we are further away than we initially thought. This is when I tend to want to simply forget about ever discovering that "thing" I am supposed to be. And why is that so important? To try to fit myself into an identity or a role that I think I am to engage for the rest of my life. I have been silent in this blog for a while. Yes I did write a rant on letter-writing which I didn't announce to my usual list of readers but just let it sit there to be found by those who might happen by. Lisa Fox of My Manner Of Life has also been in silent mode. 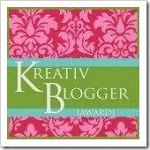 I have read some blog entries by similar spiritual women who have wondered if their blogs should or could continue. Closeted Pastor and Gartenfische have approached this subject and I like what they say about it, and the support they have received to keep on writing. All three of these blogs by these extraordinary women should continue in my opinion but then I am selfish in this respect because I love reading fine writing about things that really matter in life. I know I can find substance in each one of these places given the articulate prose. and her poetry offerings as well as her prosaic commentary on poets of our time to be refreshing and enriching. I also recommend the pithy writings of the author of Wyrdbyrd's Wyrld where topics are many and the views are varied. And if its the Barkings of an Old Dog that you want to hear, I offer you Clumber, who's perspective is vertically diminished yet brimming with good bites and dreams...of bites...of something, preferably tasty sans drool. 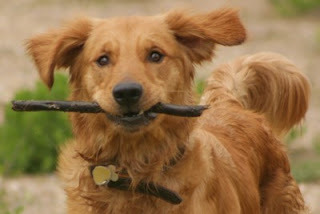 I find that dogs always have something sage to offer us, either silently [its the eye communication] or physically [dragging us by the leash, or depositing wet tennis balls in our hands]. I love the picture of Laika, the space dog's memorial statue in Moscow. I earnestly encourage you to take a look. Somehow Clumber pawed his way through cyberspace to find it. And as Clumber is a seeker of God and of the doggy esoteric, I too am seeking God in the everyday, in the dogs [I am becoming partial to golden retrievers, hence the blatant dog picture] I happen upon [and occasionally the kitties; most definitely the rabbits], in the people I meet, intentionally or otherwise...perhaps my journey is about them, or they are in some way a part of my journey in finding out who I am and what I am to be. I welcome the thoughts of my readership and their perspectives on the matter. I admittedly say that I become tired of feeling lost in certain aspects of my life. But maybe this is the way its supposed to be: that there is no "fitting in", that we are always going to be in a state of flux. Perhaps in my spiritual life, floundering is part of the finding. Either way, I am never alone. 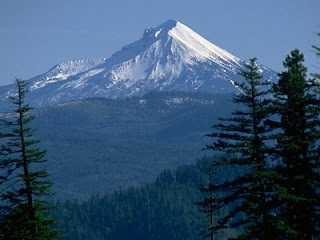 The photo of Mt McLoughlin is courtesy of the USGS and the picture of Dewey the golden retriever is courtesy of his human, Shawn Nolson at shawnolsen.net. The sleeping volcano that is Mt McLoughlin is in huge, plain view of my office in the northern part of the Rogue Valley of southern Oregon. Letterwriting 501: "Your mailbox is empty"
Being a Healer/Idealist is not necessarily fun. Or is it meant to be, but there are perks and then there are disappointments. Sounds like the usual story that everyone seems to have. I am a person of expectations. More often than not my expectations, though not that excruciating, seem to get left in the dust of everyday life. For example, I just don't know why people cannot have the forethought to be on time for an appointment; it baffles me. And so, I remain stunningly baffled. I suppose that we are all expectant of something, more or less as the case may be, but I have learned that disappointments can be reshaped into something other than, well, disappointment. A while back I issued a post regaling the wonders of letter writing, the old art that--thanks to texting and emailing--has gone by the wayside, as it were. And so I have been writing letters, sending them forward into the world, looking fine and on a mission...never to be heard from again. Sad fact, that. Do people think that just because they receive a letter--hand written and stamped--that it doesn't merit a response, even a postcard? I know I sound rather piqued [can you tell I have been reading Jane Austen?] and even affronted, but there it is. I truly do love buying stationery and am particular about stamps to go with, but why do I continue to do it if no one responds? Part of me says "for the love of the language", and another part quietly and transparently whispers, "because I want someone to see me for me". I do it for both reasons, I confess. We tend to take one another for granted in this contemporary and modern life of ours. We look at the outward appearances and not so much on the inside. I think we are afraid to let others see who we really are, in all of our vulnerability and frailness. I'm tired of being afraid for those very reasons, and in my letters I give voice to the inward turnings of mind and spirit, to the life I wish to give to my garden, to my creativity, to my usefulness as part of the human element, h-8 [turn the 8 on its side for the proper symbol of infinity]. I write the way I think. Often I hear people say that "if only I could write like you", and I say, write the very way you think, with all the "uhmms" and "ahhhs" included, and you will not only write like me but more so yourself. As time goes by, you will supplant the awkward pauses and the sounds that go with them with real, meaningful words that reflect you. I know that the learning of language is an ongoing thing, why else do I spend so much blessed [sardonic tone] time in Barnes and Noble or the antiquarian book store downtown? Language and consequently writing is like a gourmet feast. There is always something more to try and to improve upon as each of our palates will always be different from the other. So I am "wahhhing" about not the sending forth but the lack of reciprocity in regard to letters. To some it will seem petty, to others pitiable, but that is not what I want. I just want a letter from one of the many people I do write to, who claim they love receiving my letters but have not deigned to reply and bring me the joy of knowing I am being thought of even a little bit. I do believe I am worthy of a stamp [and I don't mean one on my foot...teehee!] as those I have written are likewise worthy. Have you ever read the letters of some well-known literary personage, like Karen Blixen, who wrote "Out of Africa" and corresponded with her reticent friend and lover, Dennis Finch-Hatton? Or Winston Churchill and his wife? There are many published books of letters that convey what has for the most part, been lost to us in modern times. Communication. I encourage the reading of such literary collections for the edification of the mind as well as the restlessness of fingers considering the pen. Letters reveal us in ways nothing else can. And what, one might ask, has this to do with the Episcopal Church? Absolutely nothing! That is the point, unless you want to write a letter to 815, or a "thank you" note to your priest or an usher, or to that quiet person sitting in the back of the church...you could make their day just by putting ink to paper. Today is April 1st and all the goofiness that goes with. Over at the Episcopal Cafe, the story is of athletic proportions...literally. It is where "peanuts meet Cracker Jack" as ENS writer Jan Nunley+ reports. Even ++Katharine has something to say about it.